Description: Our booklet printing service gives you 4 paged wedding booklets printed in full colour or 8 paged wedding booklets printed with a full colour cover and with black and white inner pages. Our wedding booklets are printed on eco-friendly paper from sustainable sources. 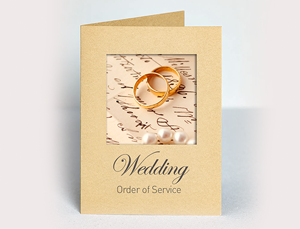 If you need your wedding booklet printing sooner, contact us to discuss a quicker delivery time. Azimuth Print, the UK's premier wedding booklet printer offers a high-quality fast wedding booklet printing service. All A5 4 page wedding booklets are printed on 250gsm Matt board. They are scored and supplied folded ready to use. All pages can be printed in full colour. All A5 8 page wedding booklets are printed with the cover on 250gsm Matt board, and the inside 4 pages on 130gsm Matt paper. The cover, inside front cover, inside back cover, back over are printed in colour and the other four pages in black. They are stitched and supplied ready to use. Our wedding booklets are used for Church Services, Masses, Civil Partnerships and Civil Ceremonies. They are also perfect for use as an Order of Service. We provide a free online wedding booklet design service. If you do not have print ready artwork and you would like to create your own wedding booklet design, try our Online Design Studio. You can create your artwork from scratch or you can select one of more than a thousand wedding booklet templates. Our Online Design Studio is easy to use and it is FREE! All wedding booklet prices include artwork, all you have to do is supply up to four pictures as digital files or printed copies and the running order as a Word document, names of hymns, poems and prayers is normally sufficient as we can provide them from our library. To find out more about the UK's premier wedding booklet printer, just get in touch for a quote or for answers to any questions you might have about our wedding booklet printing services.